SineWave Guardian™ is the best-in-class filter that delivers unequaled performance in cleaning the PWM waveforms generated by VFDs. 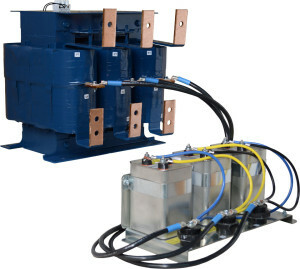 It virtually eliminates high frequency content and voltage peaks, thereby reducing motor heating to give you extended motor life – and less downtime. The SineWave Guardian also offers incredible reliability and durability. It is more efficient and tolerates higher ambient temperatures making it ideal for a variety of applications from steel mills to oil fields. Its modular design and smaller footprint make it easier to integrate and install. It all adds up to the best SineWave filter and the best value on the market today. Reduce motor heating through reduction of high frequencies and reduce motor insulation stress through reduction of motor peak voltages. Reduction of high frequencies output eliminates the need for special motor cables. Lower operating cost and improve productivity with performance that protects motors, reduces noise and emissions. Fewer components, easier wiring, and no fans or resistors lower installation cost, simplifies integration serviceability. Designed to operate in high temperatures, up to 60C, for a wide range of applications. The best product deserve the best warranty.